Six new exhibits opened at the Brattleboro Museum & Art Center (BMAC) in early March. They include large paintings by a reclusive Vermont artist who has not exhibited publicly in nearly three decades, glass creatures based on children's drawings, detailed narrative paintings, collaborative fiber art, an immersive mixed-media installation, and paintings documenting several generations of an African-American and Cape Verdean family on Cape Cod. SANDY SOKOLOFF's artwork was exhibited in New York and Boston from the 1970s through the early 1990s, at which point he withdrew from the art world to focus on painting. "In the past 25 years, there are very few human beings who have seen my work—no more than nine, including my wife," Sokoloff said. "I'm someone who has opted to live in isolation and try to realize my vision. I'm at a point in my life where I'd like other people to see it now." BMAC Chief Curator Mara Williams recently became the ninth viewer of Sokoloff's new paintings. "Emanation" features large acrylic paintings, each approximately nine feet wide, most of which are from the series "Sephirot (The Quabalistic Spheres)" and one of which is from "Archangels," Sokoloff's newest series. 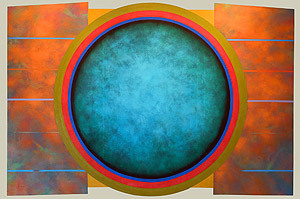 Williams said, "Contemplating Sandy Sokoloff's large-scale, vibrantly hued paintings brings back the childhood thoughts and feelings I had when peering into the opposing mirrors of double medicine cabinets—a sense of awe and wonder at the enormity of a universe with no edges or boundaries." While Sokoloff did not begin "Sephirot" with the Kabbalah in mind, he came across a reference to the mystical Jewish tradition while he was working on the series and discovered a connection. "The Kabbalah describes Sephirot as the manifestations of G-d that allow Him to appear in both the metaphysical and physical universe," Sokoloff said. "Investigating the paradox of an image that both appears and does not appear gives impetus to my work." GLASSTASTIC 2019 is the latest iteration of BMAC's biennial collaboration between New England glass artists and K-6 students. 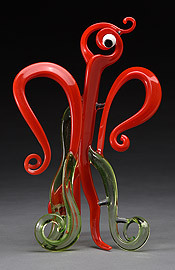 It features 20 glass sculptures based on kids' drawings and descriptions of imaginary creatures, each one manifest in three-dimensional splendor by a different artist. The creatures were selected from among more than 1,200 submissions by kids from around the world, each of which is available for viewing as part of the exhibit. As BMAC Education Curator Linda Whelihan puts it, the kids' inventive drawings challenge the glass artists to "stretch their abilities and allow them to experiment with new techniques." The results are invariably inventive and delightful. 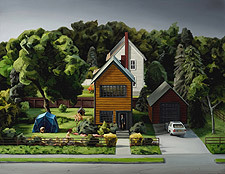 "AMY BENNETT: Nuclear Family" is a series of narrative paintings based on intricate 3D models. "I built a diorama of a fictional rural landscape and gradually developed it into farmland and ultimately, a town," Bennett said. "Beginning with an 8-foot square of styrofoam, I carved mountains, valleys, rivers and ponds, and propagated a verdant fake landscape with hundreds of wire and foam trees. I fabricated over 450 wooden buildings in 1/500 scale (similar to the size of a Monopoly hotel): houses, garages, commercial buildings, storefronts, and schools and painted each by hand. The tiny structures gradually populated my artificial town. I then mapped the complete village and stages of development over time, documenting the changes in my model through a series of paintings and monotypes." Bennett's unusual process affords her complete control over lighting, composition, and vantage point, and enables her to achieve a desired dramatic effect in her paintings. "Connections," featuring the work of fiber artists JACKIE ABRAMS and DEIDRE SCHERER, is the latest installment in BMAC's occasional "Dialogue" series of collaborative exhibitions. Abrams is a fiber artist who builds colorful vessels from such materials as sand, silk fabrics, wire, and recycled plastic bags. Scherer works primarily in thread on cloth. "The detailed patterning of printed fabric attracts me for its pointillist-like interaction that actively engages the eye for completion," Scherer said. In the exhibit "Connections," the medium for Abrams' vessels is Scherer's paper works, which Scherer creates from two digital prints of a fabric original, ripped and reintegrated as woven forms. Abrams and Scherer have created richly textured structures that reflect the character gained by the human body as it ages. Abrams and Scherer will speak about their collaboration at BMAC on Wednesday, April 24, at 7 p.m.
JOEY MORGAN's "Catch + Release (2) Précis" is an immersive environment that fills the museum's Mary Sommer Room with mixed-media work and video embedded in sculptural elements. 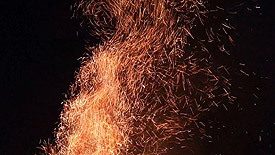 "The central feature of Joey Morgan's immersive installation is a projected wall of fire," Williams said. Other elements include a multi-panel abstract painting, a small sculpture, and a series of QR codes linking to short videos. This work explores the reliability of memory and the nature of dreams. 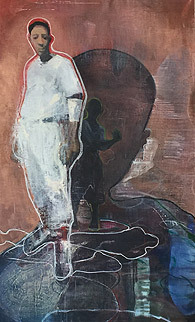 JOSEPH DIGGS: "Proud 2 Be American" consists of oil paintings that memorialize and celebrate several generations of the artist's African-American and Cape Verdean family. Diggs was born in France as an Army brat; his father was in the military before settling down on the family's property in Osterville, Massachusetts. Diggs' ancestors were originally crop workers in the cranberry bogs, but they were entrepreneurial and bought the land that Diggs continues to live on today. Baseball, service to country, and Joe's Twin Villa, the family's once-celebrated bar and jazz club, feature prominently in Diggs' paintings. "They are complicated compositions," said Williams, "in which faces, text, or symbols provide clues to the family's place in the history of the United States." The museum is open 11:00-5:00 daily except Tuesday. Admission: $8 adults, $6 seniors, and $4 students; free for members and children 18 and under. Thursdays free 2:00-5:00 p.m. Located at the intersection of Main Street and Routes 119 and 142 in downtown Brattleboro, the museum is wheelchair accessible. For more information, call 802-257-0124 or visit www.brattleboromuseum.org.